It all started with a body composition test using the InBody 270 machine at the Short Pump American Family Fitness. My results were not what I had hoped for. You see, I used to work out quite a bit (mostly cardio) and I try to eat well most of the time. I’m careful to balance the calories I consume with the calories I expend to maintain my weight within a four-pound range. But then I had an injury and I took a temporary break from exercise. That was over two years ago. And the time I used to devote to exercise filled up with kids’ activities, a new job, and all the responsibilities that come with being a 40-year-old grown up. Physically, I was beginning to feel weak, and my back and legs ached. Mentally, I just couldn’t figure out a way or a time to make regular exercise a part of my life again. And emotionally, the just thought of starting over again was exhausting. When I did the InBody test in October, even though I had hoped for better results, I was not surprised. The first thing I saw was my body fat percentage was 5% more than what it used to be. But other than that, I really didn’t know what to think of all the numbers. So I asked Chris Moore, Fitness Director at the Short Pump American Family Fitness, to take a look at my results. According to Moore, I had “some funky asymmetries that put me at risk for injury.” My upper body was weak and so was my core. My left arm was weaker than my right arm. My legs were strong, but they weren’t equally strong. Chris probably didn’t actually say “funky asymmetries,” but regardless of what he said or how he said it, it was an honest assessment and it was exactly what I needed to begin thinking about making a change. Four weeks later, I made the decision to start personal training, and I committed myself to trying it for three months. 1. My body fat percentage dropped almost 3%. At the start of my training, my body fat percentage was 26.5%. Six weeks later, it is 23.8%. 2. I lost 0.6 pounds. Weight loss was not my goal, but I still lost 0.6 pounds. 3. I had an overall gain of almost 2 pounds of muscle with the biggest gains in my arms and core. The amount of muscle in my body is also now more evenly distributed. My “funky asymmetries” are almost symmetrical. 4. My appetite increased. And I ate more food, especially at breakfast and lunch. 5. My posture is better. It is not perfect by any means, but it is better. It is easier to sit and stand tall. 6. My back and legs don’t hurt like they used to. And I stopped taking ibuprofen at the end of the day. I am appropriately sore in the 24-48 hours after my training sessions, but that type of soreness feels good. 7. I can do 40 push-ups on my toes… in sets of 10. At the start, I couldn’t finish one set of 10 before going to my knees. 8. I started flexing my biceps for my kids… and sometimes at the gym too. ? abilities. I recently started wearing a heart rate monitor, and I love seeing how many calories I burn in a session. 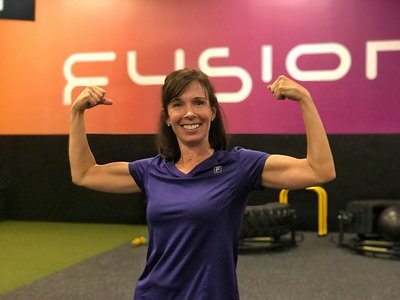 For the next six weeks, I plan to complement my personal training sessions with Fusion Team Training sessions. My nutrition goals are to include a good source of lean protein at my meals and snacks, eat more vegetables, drink more water, and have fewer chips. Ultimately, I’d like to gain about five pounds of muscle over the next couple months and lower my body fat percentage to 20%. I plan to do another InBody test after six more weeks of training and will share my results through this blog again. In the meantime, be sure to check out our other articles for more fitness, wellness and nutrition tips. 1. Get an InBody Body Composition Test before your start and consider purchasing a MyZone heart rate monitor. According to Chris Moore, “You can’t manage what you don’t measure!” The InBody and MyZone are two great tools for monitoring your effort and tracking your progress. 2. Show up. And be on time so you can maximize your session time. For optimal health, incorporate strength training at least two times per week. If you can’t work out twice a week with a trainer, aim for one session per week and have a plan in place for getting in a second strength workout on your own or as a Fusion session. 3. Trust your trainer and do your best. There are so many components that go into designing a specific, results-driven exercise program. American Family Fitness has all of the resources and highly educated trainers to facilitate all of your fitness needs. You can feel confident in walking in the door and having a qualified and educated Fitness Professional coach you towards your results!